Wow, have we had a wonderful time in Washington! We spent 5 days at various places in Olympic National Park on the west side of the Olympic Penninsula. All gorgeous. Rainforest and Beach. Lakes and beautiful sunny swimming holes. We'll try to get some pictures up for you in the next few days. The night before last it rained for the first time in 17 days! It hadn't rained since we left Prince Rupert, not for the whole length of Vancouver Island and Washington. And then it turned sunny again in the morning. Today we're at Ocean Shores, Washington on the beach taking a rest day. I hope to buy a kite and fly it on the beach. Nancy will be drawing the sunset. 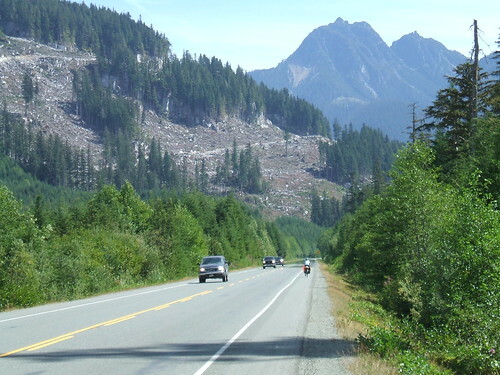 The Victoria area is like a touring bicyclist's theme park. There are beautiful trails like this one (the Lochside trail) leading you all over the city. There are ferries to take you out to quaint islands with few cars. There are sea views everywhere. And cars are extra careful of you. We met many people who just decided to go out for a couple of days and go to an island, or do a little exploration around the main part of Vancouver Island. It's all easy. Well, we got to Prince Rupert and got ready to take the ferry down to Port Hardy (at the top of Vancouver Island). The main reason for going the Prince Rupert way was so that we could take this beautiful ferry, which goes through the Inside Passage and is supposed to be wonderful. Unfortunately, I had not really done my homework, and there was no room for us at the inn. We had not made reservations, and it's running completely full due to the tragic sinking of the ferry earlier this year. Well, now we know to call in advance and check it out. We're having a pleasant time on Vancouver Island - last night was on Sointula, on Malcolm Island, just offshore. We visited Alert Bay, too, and it's definitely a place to go back to! Nancy got ambitious while we were in Stewart, BC... She wanted to find a different way out than riding back the way we came to the Cassiar Highway. So she went and talked to the people who run the US mail service just across the border in the ghost town of Hyder, Alaska. 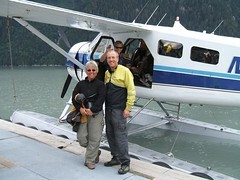 And before you knew it, we were loading our bikes into the back of a Beaver floatplane and jamming ourselves in and we ended up in Ketchikan, Alaska, which was never on our agenda! But next we'll go to Prince Rupert, BC (which was) and then to the Queen Charlotte Islands (which weren't until recently). We saw the Northern Lights! It seems impossible, but we saw the Northern Lights! It seems like we hadn't even seen a real dark night yet, but it must have been creeping up on us as we ride south and the summer slips away. One night we were camped right on the beach at the south end of Dease Lake, which is a long north-to-south lake. When we got up to pee in the night, lo and behold the stars were in the sky, but the whole north part of the sky was lit up with something else. It wasn't residual sunlight - it was all kinds of other colors and flavors. We couldn't believe it. Sorry - it wasn't bright enough for a photo! We wanted to write a quick report on the Cassiar Highway for other touring cyclists. We had a good trip (2006, north-to-south), and some things were easier than expected. 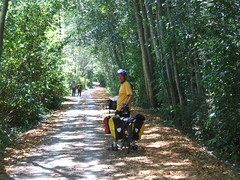 The Cassiar is a cyclist's delight, even though we had a fairly rough time with it. The traffic is light, the road is generally good, and the services are more frequent than we expected. The road is mostly paved (about 90%) and not too difficult. There are plenty of hills, but no huge passes. The 10% that is not paved can be fairly difficult (it was all mud for us, and we hate mud). But it's not really all that bad. They expect to finish all the paving in the next couple of years. We found groceries at several places we didn't necessarily expect them. 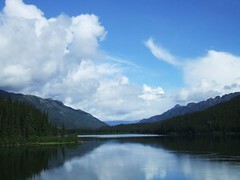 The stores at Good Hope Lake, Dease Lake, Iskut, and Stewart all had groceries. All of those except Good Hope Lake had excellent variety. However, there was nothing at Meziadin Junction. The kind woman at Moose Meadows (north of Dease River Crossing, which is north of Dease Lake) also stocks some imperishables just for the cyclists who come through. Go to Stewart and Hyder. You'll regret passing them by, even though they're off the route. 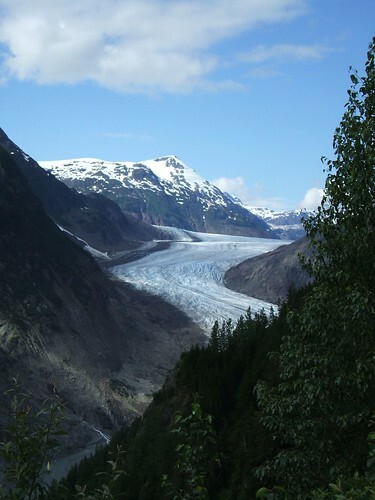 You'll want to see the glaciers and the bears at Fish Creek!